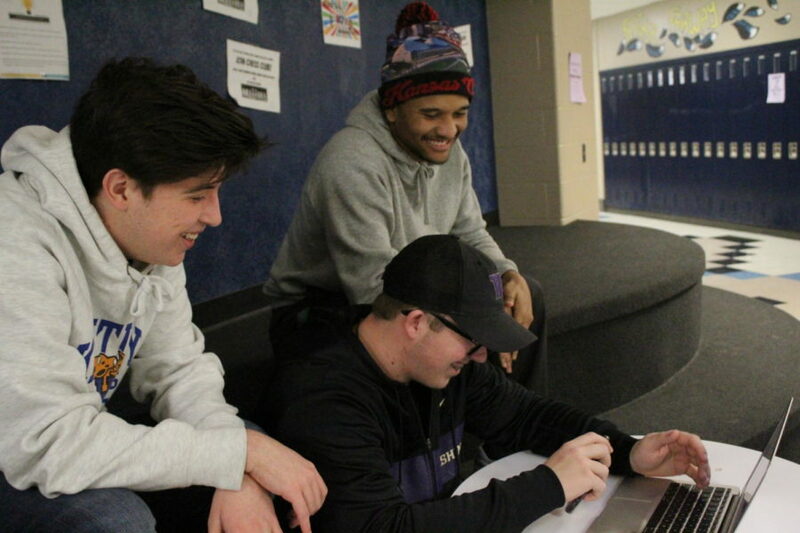 Sports Marketing students create hype videos for sports teams. Recently, hype videos of Liberty’s basketball, football and wrestling teams have been watched by Blue Jay fans. What many don’t know is that Liberty’s own Sports Marketing students creates them. After some brainstorming, Sports Marketing teacher Sara Havermann and business owner Derek Chapman create a plan for teaching students how to film and produce hype videos. Students began learning the ins and outs of hype videos through watching Chapman produce videos for his year-long business, Archer Video. Chapman went to Missouri State and filmed weddings and promotional videos while in school to study film production. Chapman then created his own business to make professional videos for anyone. With Chapman’s experience, students were able to practice using different equipment and various strategies for their own experimenting. Students were able to direct the set, develop their visions, edit their own videos and much more. With first-hand experience, students learned what makes videos work and what makes creating them difficult. However, the difficulties don’t seem to have much of an affect on the videos the Sports Marketing students created. Even though Blue Jay fans may enjoy the videos, they aren’t just for them, as many athletes feel the videos help both the team’s morale and the student section’s. Seeing the videos’ effect on students and athletes are pretty easy to notice, but what most don’t notice is what makes the creators so passionate about them. “I genuinely root for them and get excited when they make big plays. Not just for the video side, but it’s cool going to a different Friday night game and getting involved in the community,” Chapman said. Chapman’s passion is one of the main reasons that he wants to share his success and knowledge with others. And it is also why he wants to expand the program he created with Havermann by offering the same services to other schools. “The Sports Marketing program Liberty and Liberty North high school have is amazing, I would have loved to have something like this when I was in high school,” Chapman said.